6am - When driving out of a gas station [for example], the hitch sometimes scrapes the ground. We were thinking of using a small roller in order to prevent this from happening. We have moved to Beaverton City Fountain Park. The plan is to hang out here for awhile. There area lot of shade trees. A branch of the library is here too. First comes breakfast. French toast and sausage. We got word about my position on the Jojoba Hills SKP Resort wait list. I'm now #13. 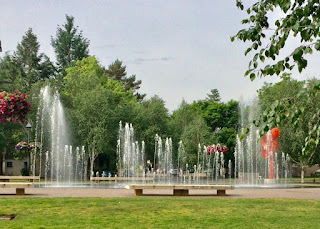 We headed westerly toward Rood Bridge Park in the City of Hillsboro. On the way, George finally got his haircut! This park may be a very peaceful place once these lawn mowers shut down. If you wish to know about this park click [Here]. 5pm - What to do now? Several readers have commented that the Honda is a very poor tow vehicle for pulling Scampy. Overall, I'd say you're slowly killing this little car. I wouldn't be surprised by possible premature transmission failure and likely premature brake wear. I think you're courting disaster applying bandaids to a basic use-case problem. OK! There it is! I very likely made a mistake thinking that I would buy a light trailer [Scampy] to be towed by the Honda. Sooooo! What to do now? Sounds like a good idea. Make sure it is near the end of the hitch where the ball is, and remember the load on the car will be opposite the normal. Fortunately, you have front wheel drive, so you won't lose traction. George, I'm not sure if this would help in your situation, but when I was getting a hitch installed on my Chevy Sonic, the installer mentioned that my rear suspension might sag a little when towing my new 13' Scamp. And if that does happen, I should look into an "Air Bag" suspension kit that would help in beefing up the rear end. I'm not sure if they make anything for subcompacts but it might be worth looking into (does anyone flash their high-beams at you while driving at night?). Too bad you're not closer to the Salem area. I'd love to meet you and ask questions about your travels! Upon further examination, I'm wondering if this scraping might have applied stress to your forward hitch attachment points (bolts), and led to the underside of your car being cracked (??). Not sure, but if you attach the roller it may further lower your clearance and scrape even more. I'd check with a welder to see if this might make things worse (or better!). In the meantime, this is a link of another possible solution. Adding rear air suspension that you control with a switch. This particular one should fit your FIT. My Dad had one on his old 1973 Buick Estate Wagon when he used to tow a boat to Lake Havasu and it worked great! I might look into this on my car as well. George, what Tom said is true; we had the same problem with our first auto tow setup, and the airbags worked. Before installation of the airbags, getting from the road into our driveway was problematic because of a dip between the road and the driveway. That was back in the early 2000 years; since then, we've moved to a truck with tighter suspension. Yes, what Tom said is true. It is also more costly than my solution [The addition of a roller]. I agree with LorbeerTLC. 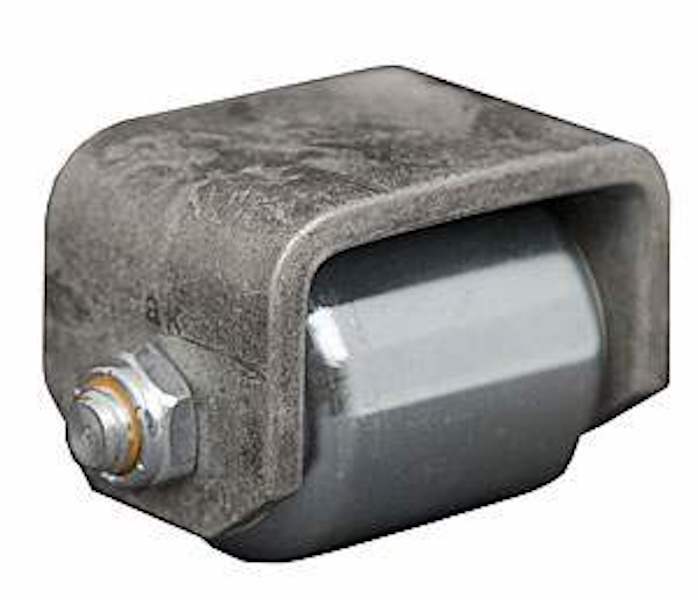 This roller will reduce the amount of clearance, resulting in bottoming in cases where it's not bottoming now. This puts a lot of stress on the sheet metal body pan, which isn't an optimum attachment point. The real problem is your car's rear end is riding too low and you need to raise it. Overall, I'd say you're slowly killing this little car. I wouldn't be surprised by possible premature transmission failure and likely premature brake wear. Just to piggy-back and maybe for peace-of-mind, I still suggest you ask a welder for their opinion/recommendation. They certainly could give you a better idea what you may be up against with either idea down the road. He/she might even offer a third option (that wasn't discussed). Either way, I understand the $$$ side, but I'd sure would hate to have any more hitch issues. Take Care and Best Regards, George! 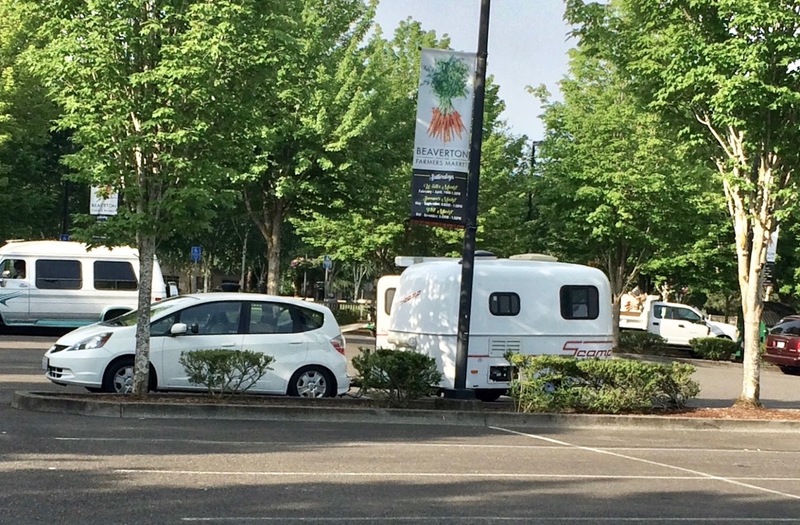 One option for your dilemma with Scampy and Little Honda is a Class B motor home. A Class B combines the size of Scampy with all the same interior attributes with a reliable and viable mode for transportation. Often these vehicles are not much larger than a van and very easy to maneuver and park. Just an idea for your consideration. George, if I remember correctly from your past posts, Pete Olsen is a "truck man." With your specifications in hand (downloaded from your computer) of Scampy, ask him if you may visit him and seek his advice regarding a good match for Scampy's specifications. Believe me, if the answer is a truck, he will advise a small one for "little" Scampy, and there will be little difference from driving Honda and a small truck; the difference will be in the rear axle and rear suspension, And, the most important part, is that you trust Pete. I am not sure what George would do with the open bed of a truck, and a shell would be hard to climb into to retrieve items needed for camping. Maybe an SUV that is rated for towing? Personally I believe you can make your little Honda FIT work with your 13' Scamp and have many, many, years of enjoyment. Your car is a testament for me to tow a 13' Scamp with my little Chevy. I know I shouldn't go across the Southwest desert during the hot summer months and I'll avoid going across high mountain grades. But going along the Pacific coast highway should be ideal. I believe you can continue towing with your little Honda FIT. It might set you back, but if it is recommended invest in getting that air bag adjustable rear suspension. I'm thinking about the one that has the compressor and gauge so you don't have to worry about going to a service station and use their air hoses. If you invest in that it could save you future problems with towing your 13' Scamp. 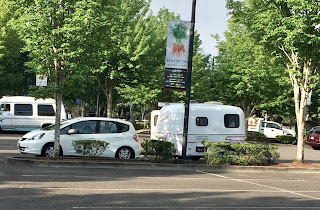 One nice thing about a small car is once you're at a camping site you can unhitch and drive into town and enjoy the amenities of driving a small car (parking for one). One other thing you might consider in investing in is a set of gauges (Coolant Temperature, Oil Pressure, Voltmeter, and since you have an A/T, a Transmission Temp Gauge). I personally dislike "idiot lights." I purchased and installed a set of analog gauges in my Sonic and I've never regretted it! They can sure tell you volumes on what those lights can't! Sending you Warm Thoughts and Well Wishes! Now if money were no option (for me anyways...) THIS is what I would have loved to have purchased! It's small and the perfect size for our travel needs! Anyway, I've done enough gabbing.